Monkey bread is a fun addition to any dessert table, regardless of the time of year. This recipe features everyone’s favourite… M&M’s. But, you can easily replace them with another type of your favourite candy. How did the bread get its name? Have you ever watched monkeys at the zoo? They typically pick apart their food before they eat it. And, before that, the bread was commonly referred to as aranygaluska. I dare you to say that, three times fast! Translated, it means “golden dumpling.” This dish was extremely popular with Hungarian immigrants, during the 1800s, who brought the recipe with them to the United States. The original version omitted rolling the dough balls and cinnamon and sugar. Butter was used in its place, giving it more of a pastry feel. Other names for monkey bread include “Hungarian coffee cake,” “puzzle bread,” “sticky bread” and “bubble loaf.” Whatever you happen to call it; it’s a yummy treat that will have everyone asking for more. The ease of preparing this recipe can be attributed to using refrigerated biscuit dough. Simply cut each biscuit into quarters and you’re good to go. This recipe instructs you to bake the bread in a Bundt pan. However, if you don’t have one available, you can probably just as easily use individual ramekins to make mini breads. Adjust the baking time accordingly, until the dough is golden brown. 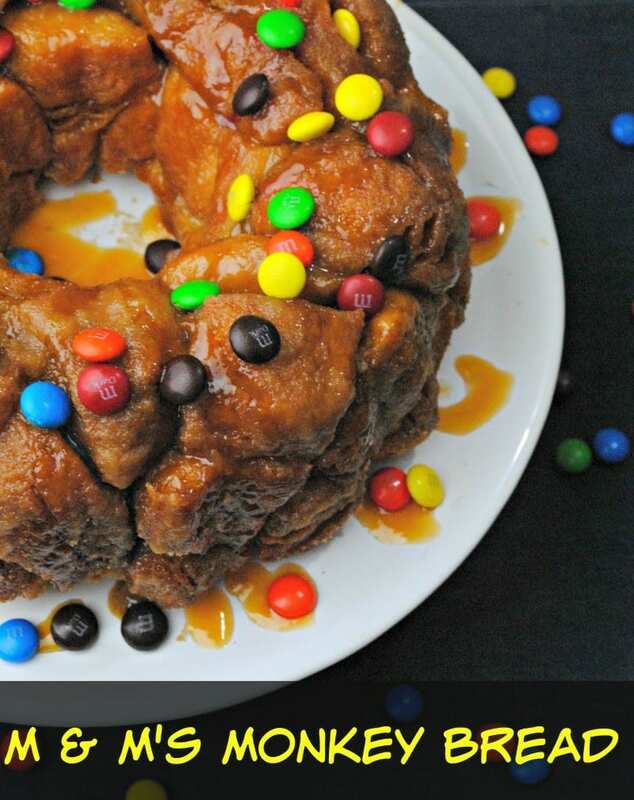 Drizzling caramel sauce over your M&M’s monkey bread kicks the recipe up a notch. If you’re not all that fond of caramel, chocolate is a suitable replacement. Better yet, live a little and use both. One of the most enjoyable things about baking is that you’re the boss! If you want to get creative in the kitchen, there’s absolutely nothing stopping you. So, why not make some yummy monkey bread today? Spray your bundt pan with non-stick cooking spray heavily, and set aside. Open the cans of biscuit dough. Cut your biscuits into quarters. Place 2 pieces of M&Ms into the centre of one quarter and add another quarter on top. Press the edges. In a small sauce pan, combine the butter and brown sugar. Mix until melted and combined. Combine sugar and cinnamon into a ziplock bag. Place the M&M filled biscuits inside of the bag and shake until coated. Now begin place the dough balls in the bundt pan evenly spreading them out. Pour the brown sugar and butter mixture over the dough balls in the bundt pan. Bake for 20-25 minutes, until dough appears to be a golden brown. Drizzle caramel sauce and sprinkle M&M on top. Note: The sauce should be thick, but can pour. You might have to add more brown sugar. The sauce is the binding agent. Pour the sauce evenly over the bundt pan filled with the monkey bread. Sometimes parts don’t stick the bottom layer, but just placed them right on top again. Let the bread set for 5-10 minutes. Flip it over onto the cake pan or plate. Let it sit again for the pieces to settle down into place. I hope you enjoyed my M&M’s Monkey Bread recipe! If you make it, make sure to share with us on Facebook or Twitter! Also, check out all of our other Recipes. The sauce should be thick, but can pour. You might have to add more brown sugar. The sauce is the binding agent. Pour the sauce evenly over the bundt pan filled with the monkey bread. Sometimes parts don't stick the bottom layer, but just placed them right on top again. Let the bread set for 5-10 minutes. Flip it over onto the cake pan or plate. Let it sit again for the pieces to settle down into place. LOL! Once they taste it, they will love it! It’s definitely a recipe for a family to enjoy! A holiday dish? What a great idea to make monkey bread with M&M’s! A recipe to try for the holiday season. This is super easy, and everyone loves monkey bread, this would would go over great because it has the m&m’s!! I love M&M and monkey bread,so it’s a great combination! This sounds and looks amazingly yummy! I can’t wait to make this recipe. Easy, fun and delicious, this looks like a winner recipe. Yes, Smarties would be good too! My mouth is watering! I love Monkey Bread and this recipe looks awesome! Oh my goodness, the kids will absolutely love this! Mouth watering, I have biscuits I need to cook in fridge!!!! looks good..the family would love it! thanks for the recipe! I’ve never seen this before but it looks divinely decadent, I’m in! I’ve never tried monkey bread before but it certainly sounds delicious. Great recipe, thanks. I will defintely try making this or maybe get my daughter too; She loves to bake and it looks like something that she would love to make. This looks SOOOOO yummy. Thank you so much 🙂 I am definitely making this soon!